Dr. Kutz is a past director of the Christine M. Kleinert Fellowship in Hand Surgery. He graduated from the University of Michigan Medical School in 1958, received his postgraduate training at the University of Louisville, and served as a Christine M. Kleinert Hand Fellow for one year commencing in 1963. He received the President’s Cabinet Award in 1979 and the Science Alumnus of the Year in 2002, both from the University of Detroit Mercy. In addition, he was awarded the Ephraim McDowell Physician of the Year Award presented by the Caritas Foundation in 1999. Dr. Kutz is Clinical Professor of Surgery (Plastic and Reconstructive, Hand) at the University of Louisville School of Medicine. He is a member of the American Society for Surgery of the Hand and is past president of the American Society for Reconstructive Microsurgery, past president of the Greater Louisville Medical Society and past treasurer for the International Society of Reconstructive Microsurgery. 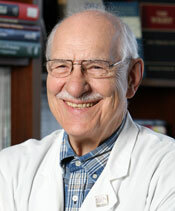 Dr. Kutz has 82 publications, 15 of which have appeared in textbooks.